You can’t go wrong with cheesecake. Especially cheesecake in cupcake form. These little individual servings are perfect to take to a potluck or cookout. If you manage to get them out of your house before you consume them all! The base is made from a basic Oreo crust, then filled with a luscious chocolate cheesecake filling. Then they’re baked, cooled, and topped with cherry pie filling and homemade whipped cream. Some chocolate shavings would also do nice for garnish sakes, but I was feeling especially lazy the evening I made these and just enjoyed them without. I didn’t miss them. I think I might try a spin on this using fresh raspberries when I find them on sale this summer. Or, I bet strawberries would be great too. Have a great weekend everyone! To make the crust, preheat oven to 325 degrees. In a mixing bowl combine the crushed Oreos and butter, mash with fork until the butter is incorporated completely. Divide mixture evenly among 12 paper lined muffin cups, adding a about 1 1/2 Tbsp to each. Press crumbs into an even layer using the bottom of a small glass. Bake in preheated oven 5 minutes. Remove from oven and allow to cool while preparing filling. For the filling, in a small bowl whisk together 2/3 cup granulated sugar, cocoa and salt until no clumps of cocoa remain. In the bowl of a stand mixer fitted with a paddle attachment (or hand mixer), add cream cheese and cocoa-sugar mixture nd beat on medium speed until smooth. Add eggs one at a time, mixing until combined after each addition. Add the vanilla and mix until incorporated. Pour in melted chocolate and mix just until combined, then add 1/4 cup heavy cream and sour cream and mix just until combined. Divide mixture among muffin cups (over crust layer), adding about a 1/4 cup (I used a medium cookie scoop) to each. Bake in 325 degree oven 17 – 20 minutes until centers only jiggle slightly. Remove from oven and allow to cool at room temperature 1 hour, then cover with plastic wrap and refrigerate 2 hours. For the topping, place heavy cream in the bowl of a stand mixer fitted with the whisk attachment. Whisk at medium-high speed until cream starts to thicken, about 1 minute. Add in the sugar and turn mixer to high, beating until stiff peaks form – another minute or two. Place whipped cream in a pastry bag and pipe or spread the heavy cream into an even layer over cupcakes then pipe a rim around edge over that layer (or if spreading whipped topping, just create a small well into the center). Spoon about 2 Tbsp of cherry pie filling into the center of each. Store in refrigerator in an airtight container for up to 2 days. Sweet baby Jesus…this looks divine! I love black forest cake and cheesecake so this is definitely going on my to-make list!! 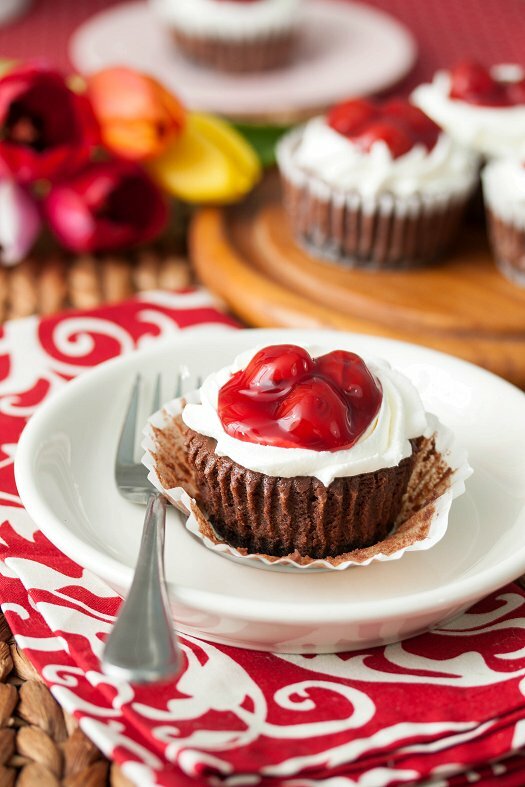 Wow…these cheesecake cupcakes look amazing! This looks like a winner to me. I had a similar recipe eons ago and I have lost it. I was always a popular person when I brought that recipe to events. So now I am good to go again! Yuuuuum! Cheesecake sounds so good right now! And your photo is gorgeous!